EDITORS NOTE: Please consider using the following caption information with the accompanying photograph. During a visit to the Southeastern Veterans’ Center in Spring City, Rep. Karen Boback (R-Columbia/Luzerne/Wyoming) led members of the House Veterans Affairs and Emergency Preparedness Committee on a tour of the facility. Boback serves as chairman of the Military and Veterans Facilities Subcommittee, which encompasses Pennsylvania’s six veterans’ homes, dozens of armories and Fort Indiantown Gap in Lebanon County. 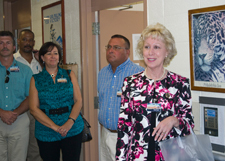 HARRISBURG – Rep. Karen Boback (R-Columbia/Luzerne/Wyoming), chairman of Military and Veterans Facilities Subcommittee, led the House Veterans Affairs and Emergency Preparedness Committee on a tour of the Southeastern Veterans’ Center in Spring City on Monday. Pennsylvania’s six veterans’ homes are open to any honorably discharged veteran and his or her spouse, whether or not the veteran saw combat. Veterans’ homes receive per-resident stipends from the federal government, but are also funded through state dollars and resident co-payments. The Southeastern Veterans’ Center provides residents with an on-site chapel, library, barber, pharmacy, and bank, as well as physical therapy services. Residents also are provided access to health care professionals, 24-hour nursing care and dentistry care, without leaving the grounds. The nearly 200-bed veterans’ home is undergoing an expansion, which will be completed next spring. The new wing of the facility, which will connect to the existing building by an enclosed walking bridge, will house 120 veterans and will incorporate a more home-like atmosphere through the use of community living. The new unit will be equipped to house 30 veterans diagnosed with dementia. The remainder of the facility will be subdivided into smaller 15-bed units, offering each resident a private sleeping area and access to a shared communal living area. The federal government contributed 65 percent of the funding for the $41.2 million expansion project, with the state funding the remaining 35 percent. The expansion is expected to cut down on the six-month waiting list for veterans who are no longer able to care for themselves at home. Boback serves on the board of the Veterans’ Home Advisory Council for the Gino J. Merli Veterans’ Center located in Scranton. She has been an outspoken advocate for veterans’ issues and has coordinated with federal, state and non-profit entities to assist veterans in underserved areas. More information about Boback and the State Veterans’ Home System is available at RepBoback.com or Facebook.com/RepBoback.